I told myself that as of this last birthday, I was going to start eating better and really focusing on healthier eating. 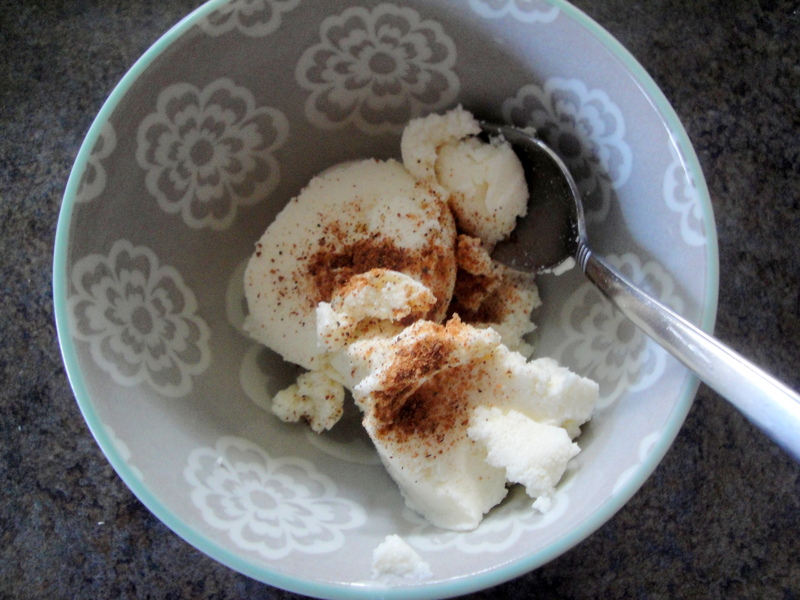 The reality is, when I eat healthier, I actually feel better (duh…who knew?!). But I know this healthier lifestyle will take some time and let’s face it, when you have a food blog, it’s not really that easy sometimes. 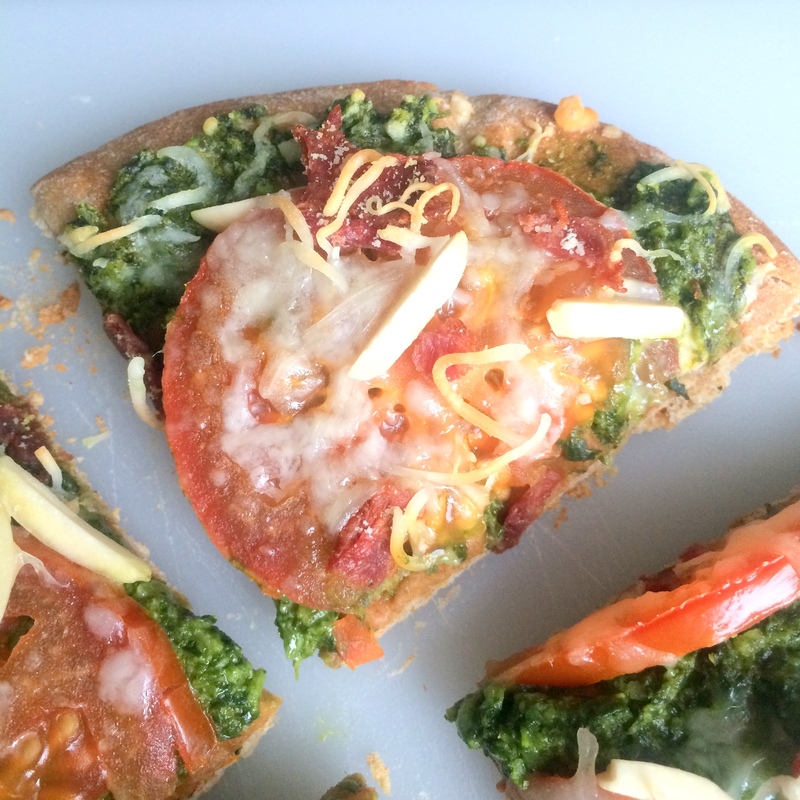 Well, I made these Pesto Tartlets last weekend and because they are made with puff pastry, they may not be the healthiest things in the world but they are not really the worst for you either. 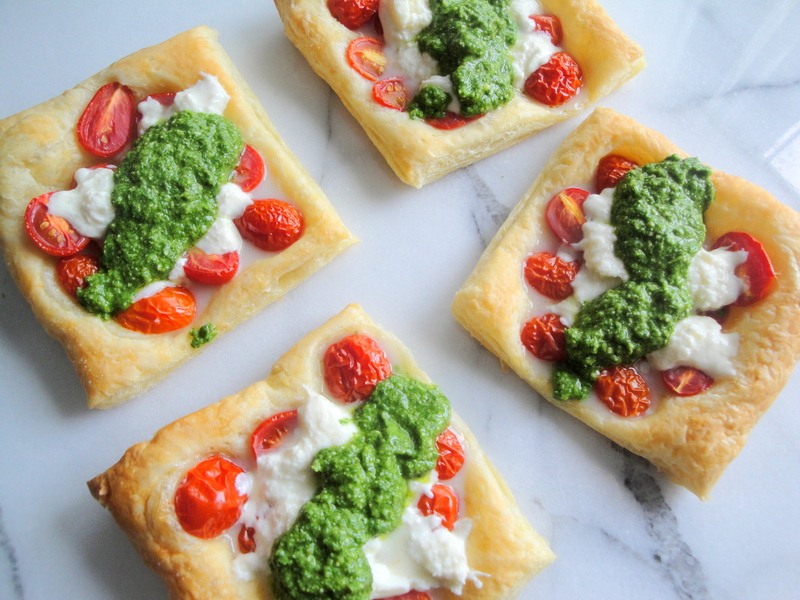 Puff pastry is topped with bright grape tomatoes and baked before being topped with fresh burrata (or mozzarella) and an arugula pesto. 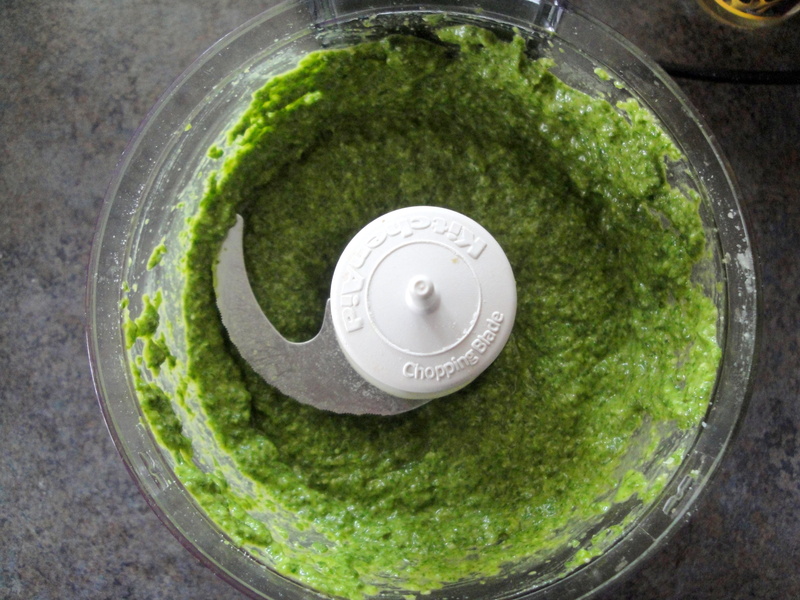 The pesto is made with arugula, parmesan, garlic, olive oil and vinegar and has different kick than regular basil pesto. I used about half of the olive oil called for and my pesto was plenty flavorful with a perfect consistency so use your judgement with how much oil you use. The crust is buttery, the grapes are juicy, the pesto is vibrant and the cheese is creamy which makes this tartlet a little slice of heaven. 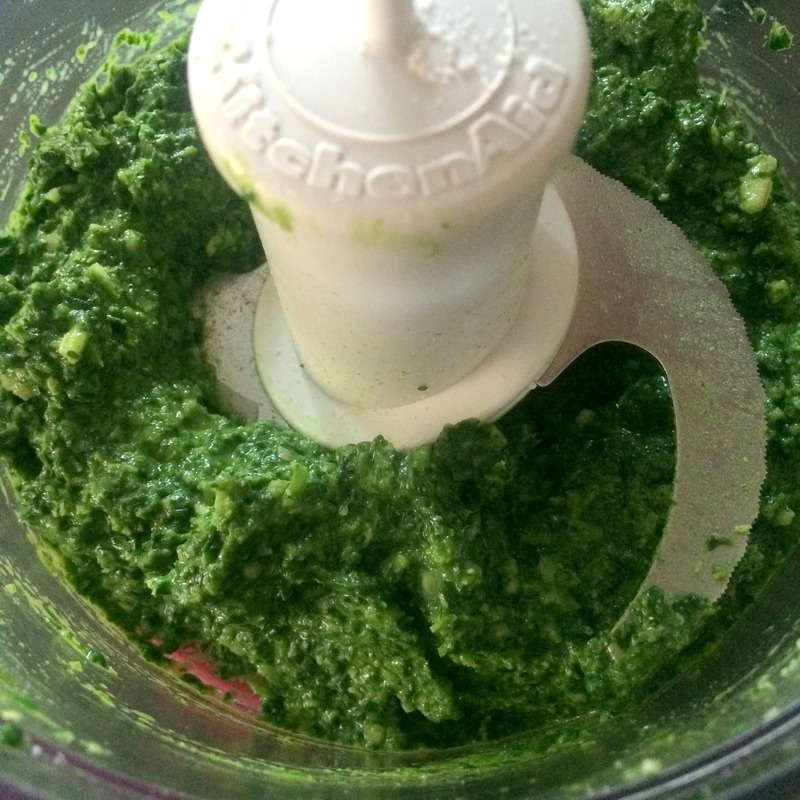 This pesto also tastes great with pasta or chicken so save any leftovers. Looks like I’m eating fruit the rest of this week. 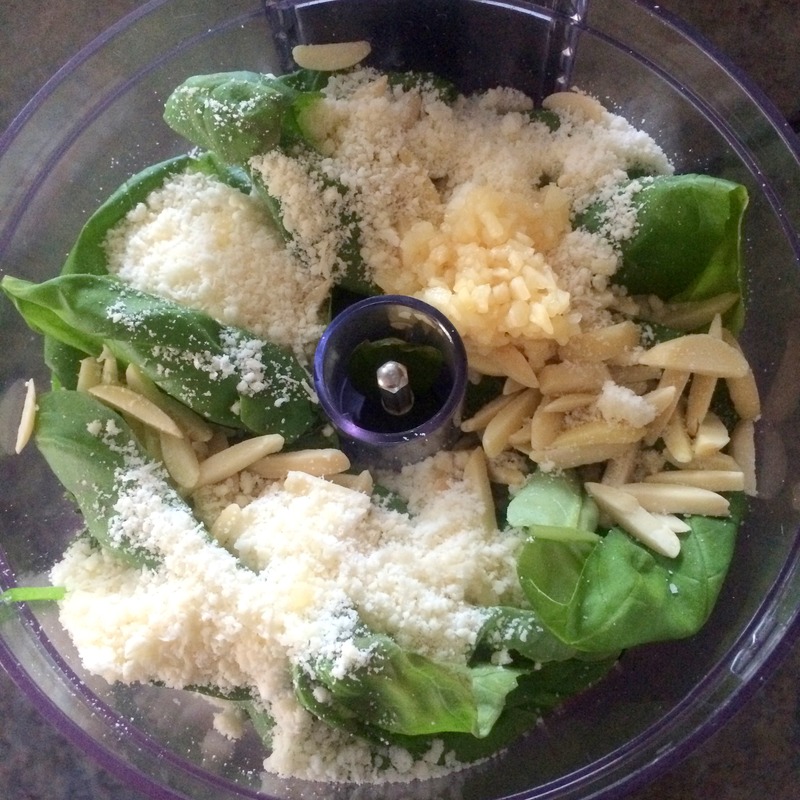 In food processor, puree arugula, Parmesan, olive oil, vinegar and garlic; season. 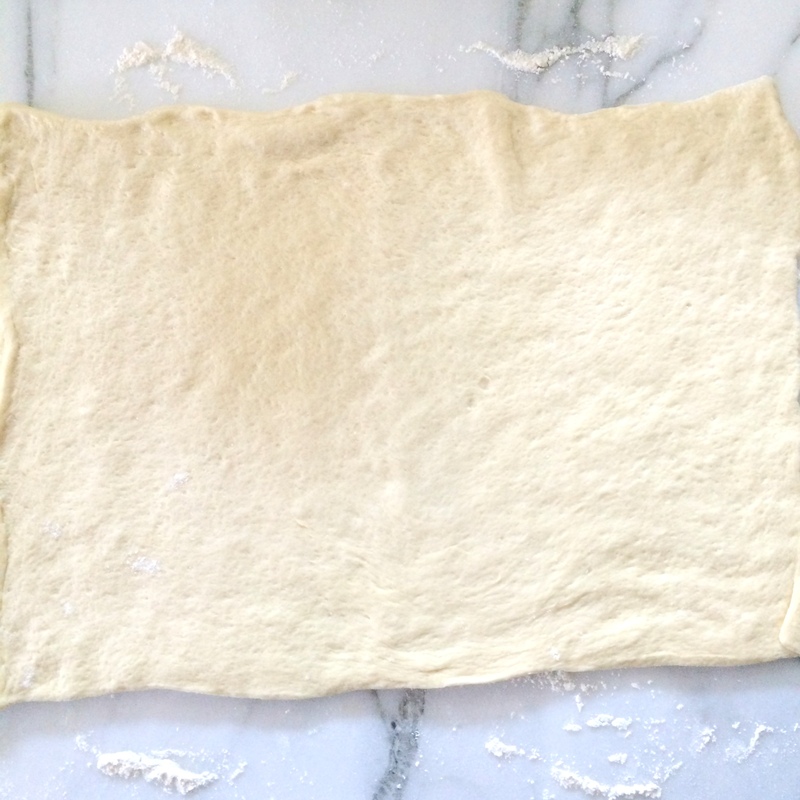 Put puff pastry on parchment- lined baking sheet; pierce with fork. 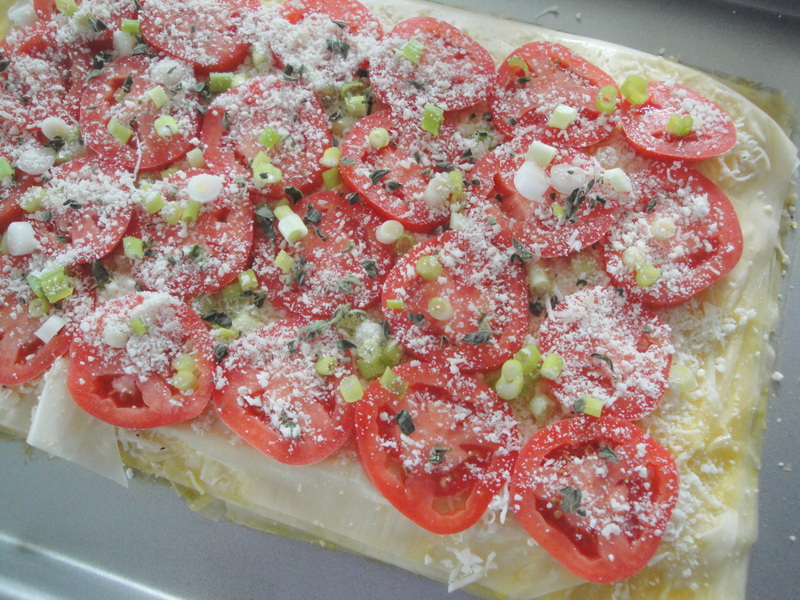 Top with tomatoes; season. Bake at 425 degrees until crisp, 15 minutes. 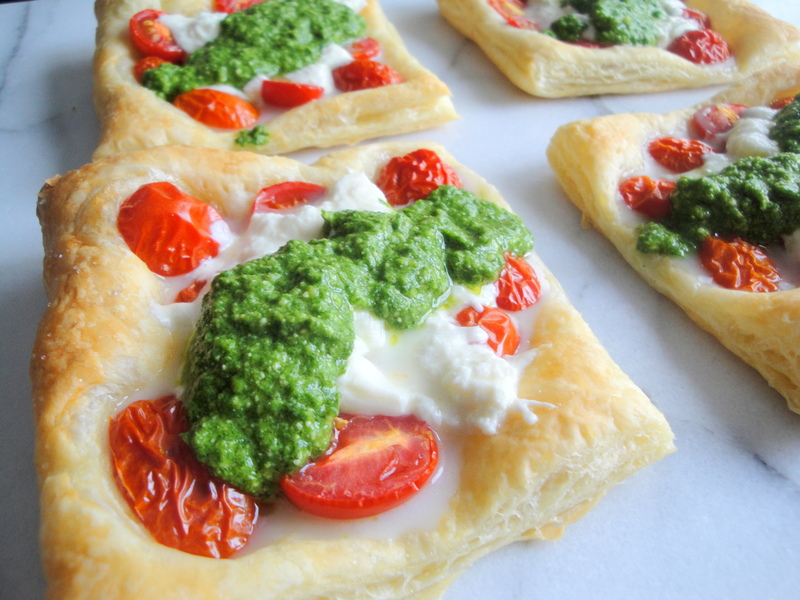 Top with burrata and pesto. 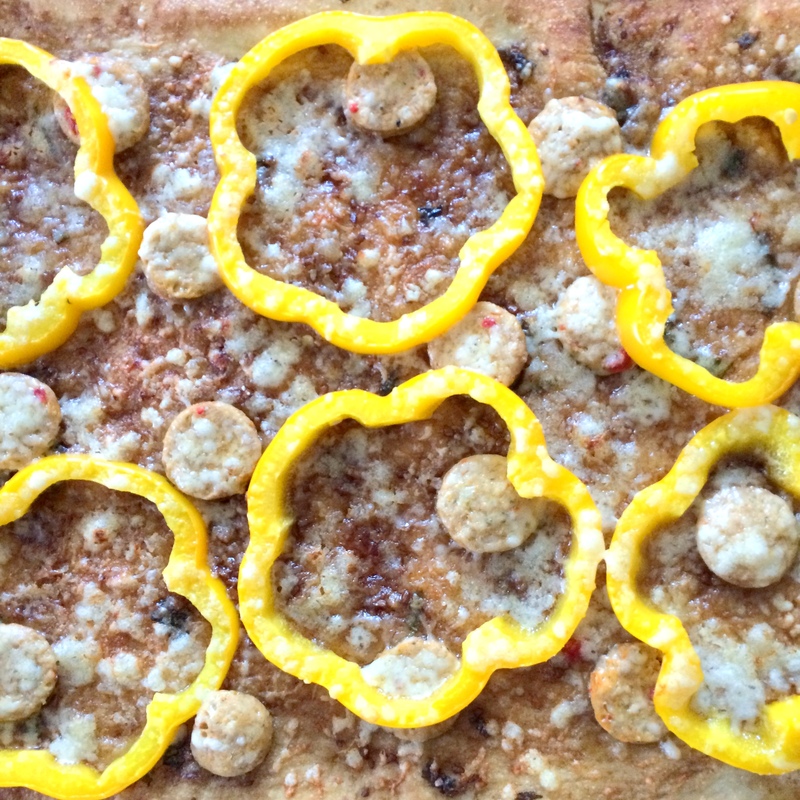 I have to tell ya, I’m really getting into this pizza on Fridays thing. 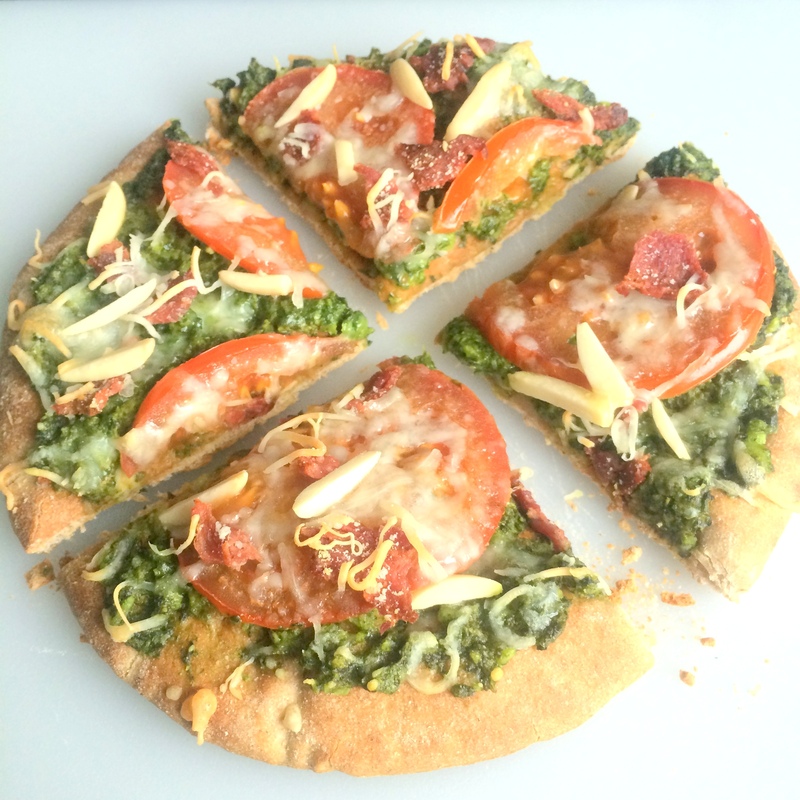 And since I’ve been trying all different kinds of pizzas, I’m used to eating pizza that doesn’t have a lick of tomato in it at this point. 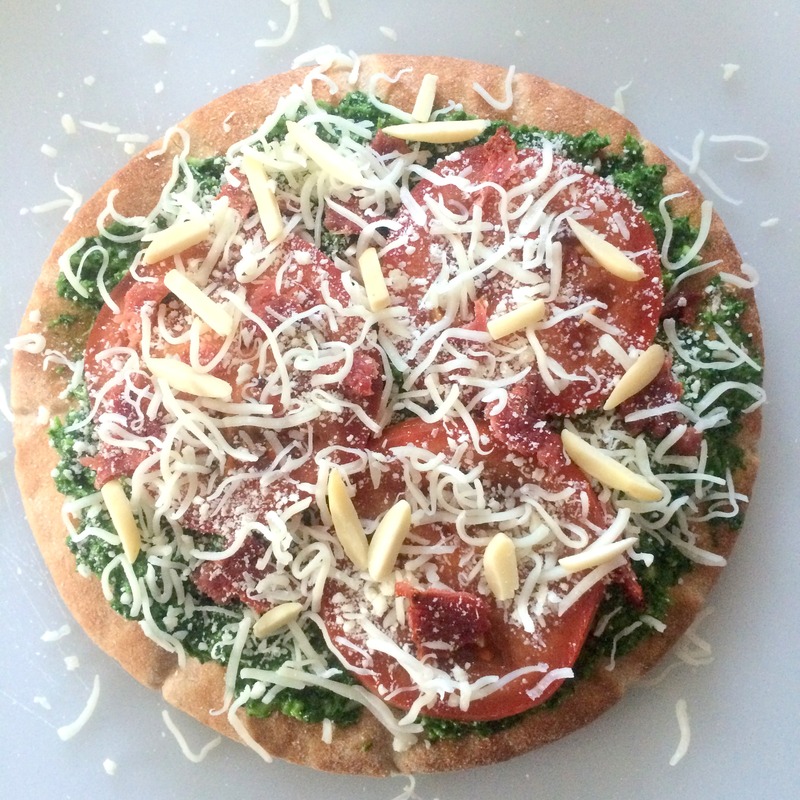 But now I’m resorting to making a pizza that doesn’t even use pizza dough? Who am I? 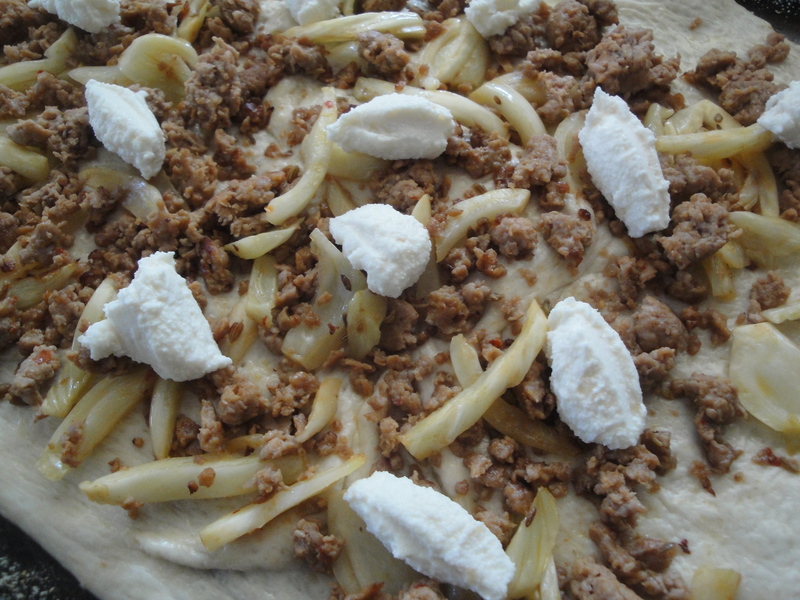 The great thing about phyllo dough is it can easily be used in both sweet and savory dishes (à la Baklava and Spanakopita) so why not make it the basis of a pizza? 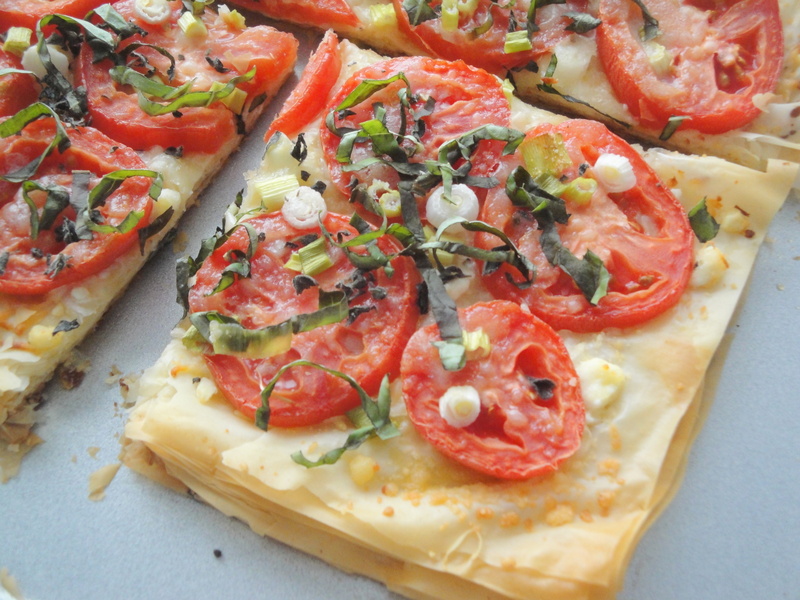 This Phyllo Pizza with Feta, Basil, and Tomatoes does just that perfectly. 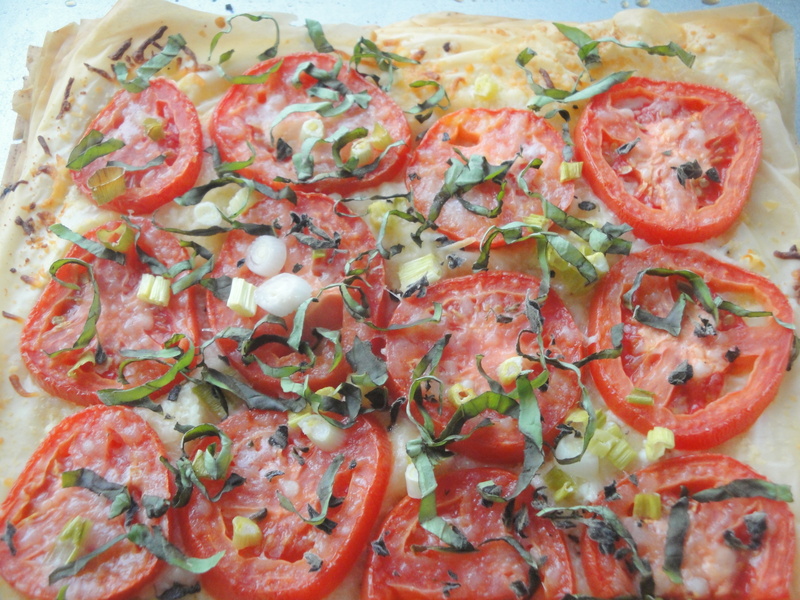 Sheets of phyllo dough are layered with a combination of mozzarella, Parmesan, and feta cheeses and topped with slices of fresh tomatoes, basil and scallions. Fragrant oregano gives this pizza a traditional Italian herby feel while the phyllo and feta keep it grounded with classic Greek flavors. 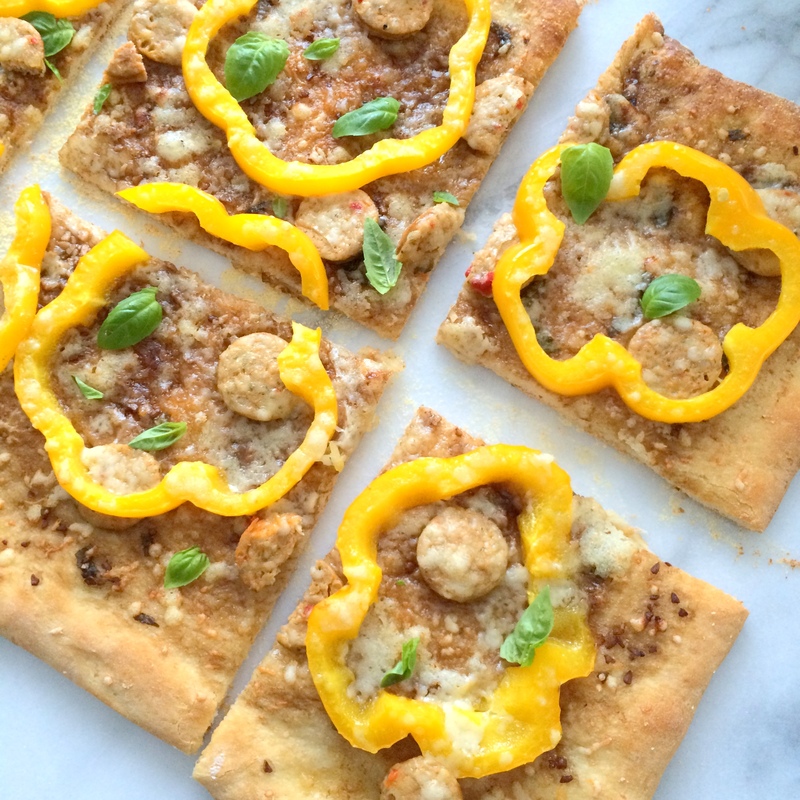 A simple pizza with nothing more but tomatoes and basil is always going to be a hit to me but the addition of phyllo and feta here make it extra special. Don’t worry if you get confused by the directions like I did, just layer the cheese and phyllo sheets and even if you mess it up, it’ll still taste perfect. 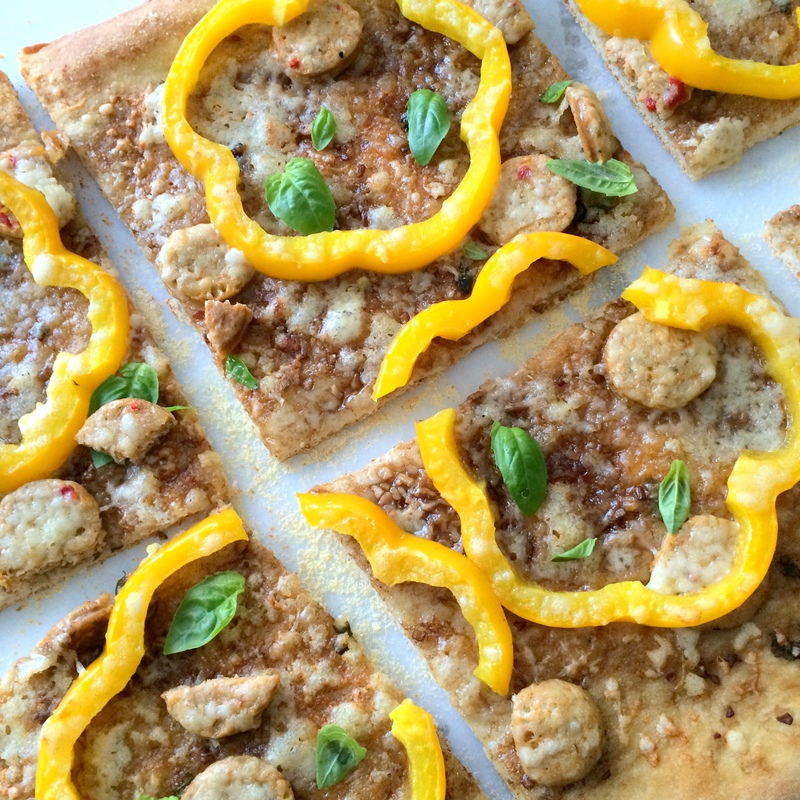 This pizza is a real winner! Preheat oven to 375°F. 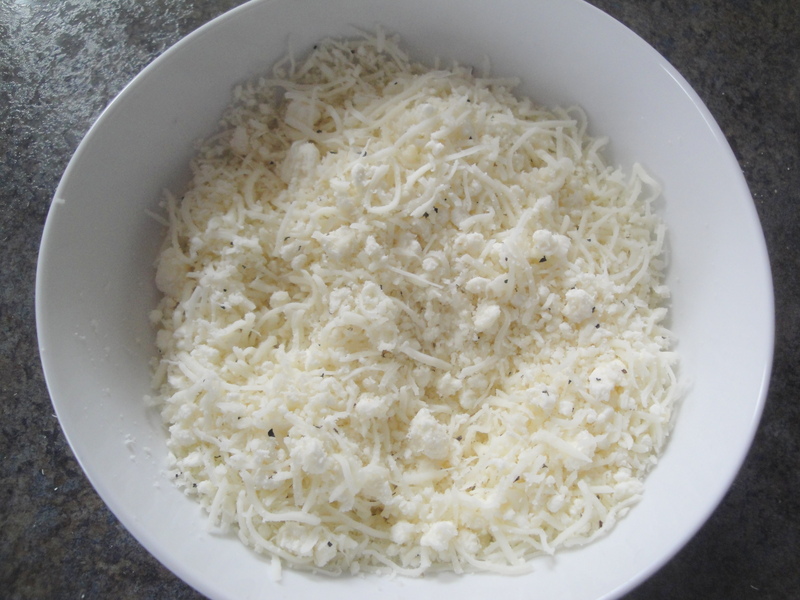 Combine mozzarella, feta, Parmesan, oregano, salt and pepper in a bowl. 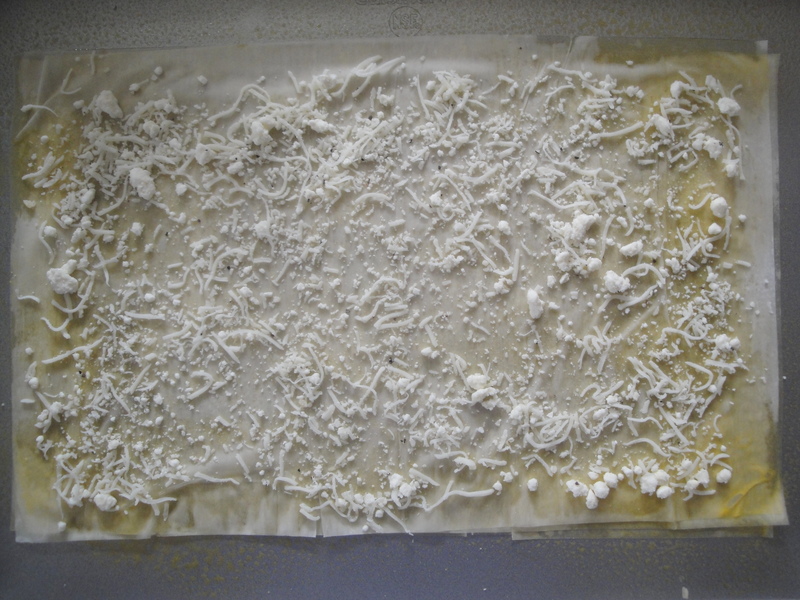 Cut phyllo sheets in half crosswise. 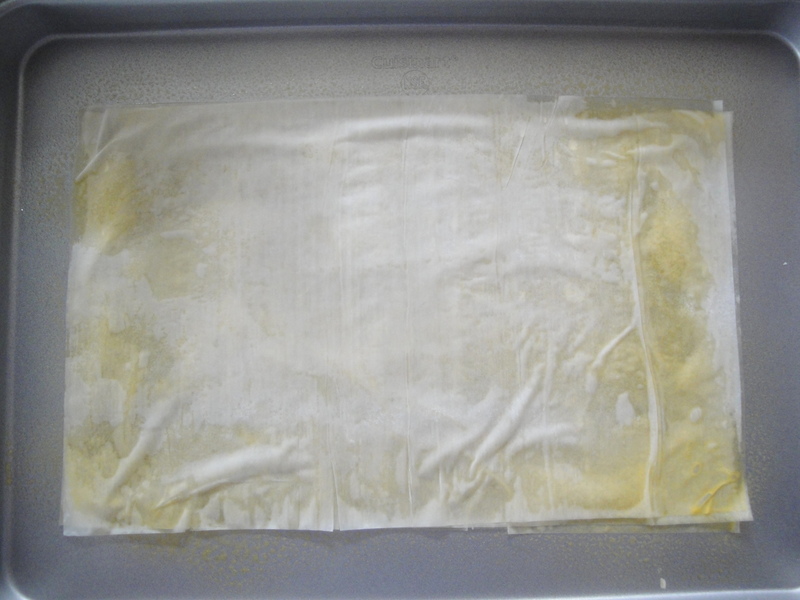 Working with 1 phyllo sheet half at a time (cover remaining dough to keep from drying), place phyllo sheet on a baking sheet coated with cooking spray. 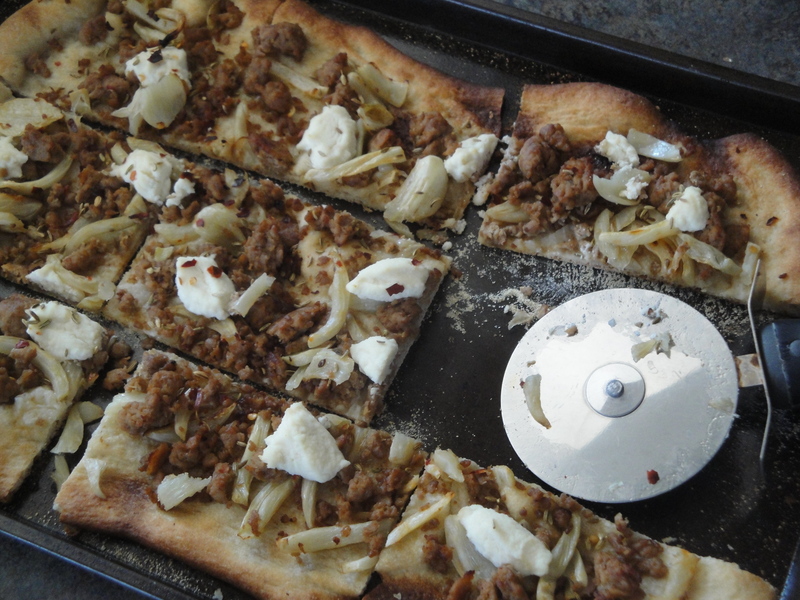 Coat phyllo sheet with cooking spray. 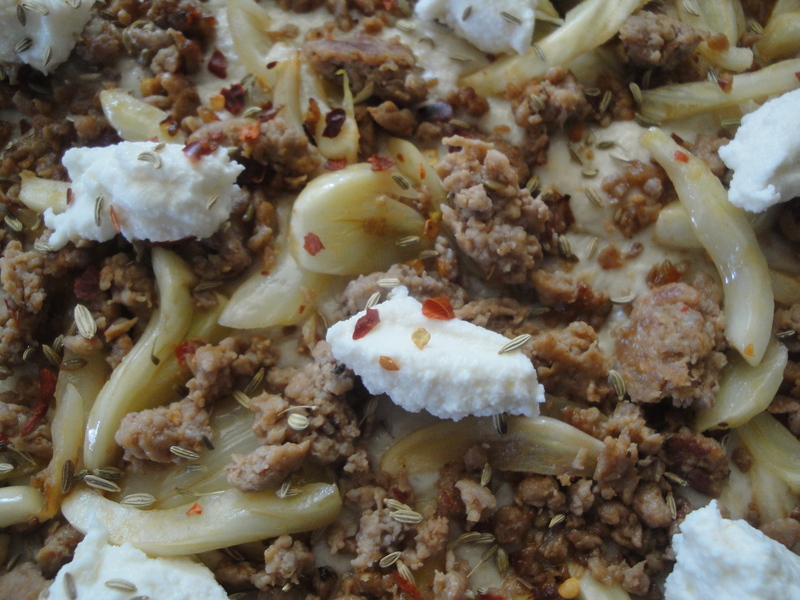 Repeat with 2 more layers of phyllo. 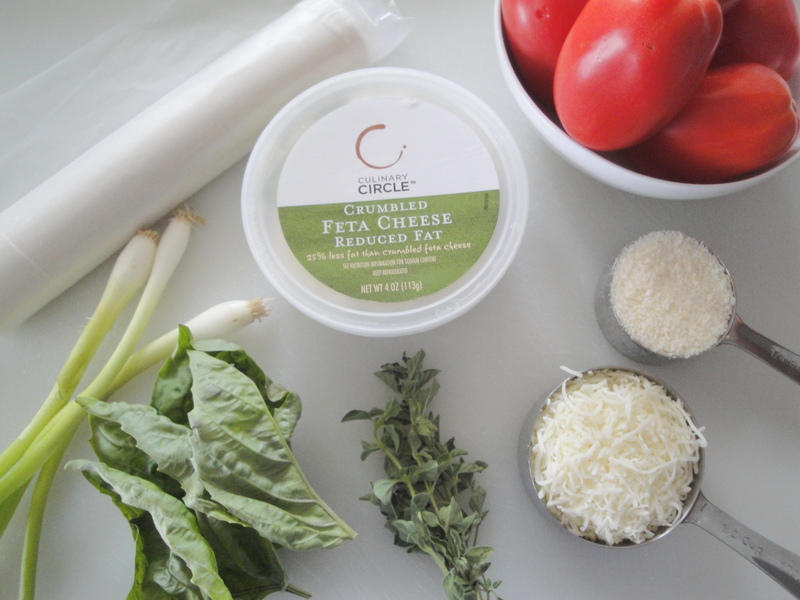 Sprinkle with 2 tablespoons cheese mixture. 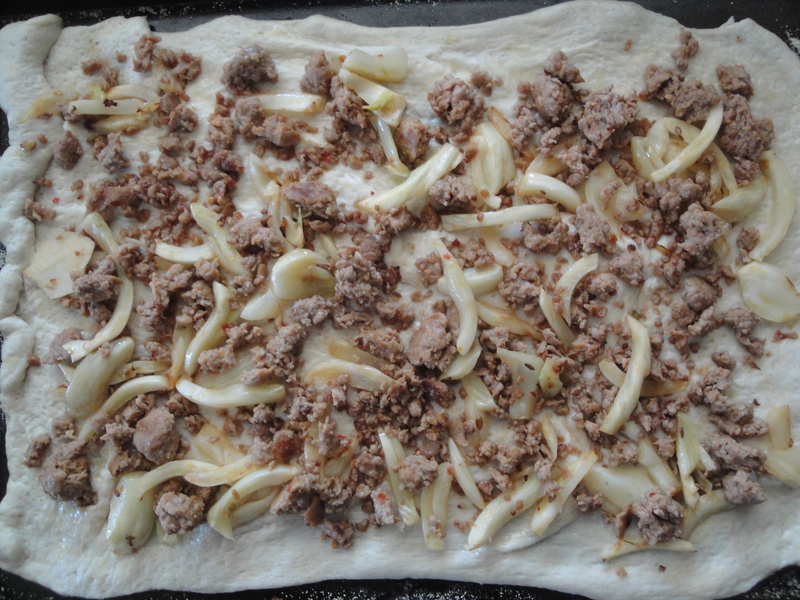 Repeat layers 5 times, ending with 2 phyllo sheets. 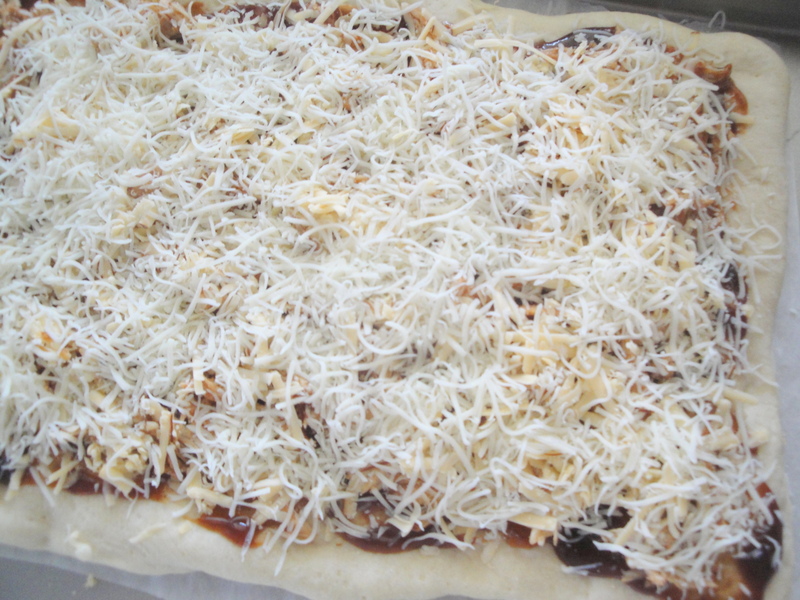 Coat top phyllo sheet with cooking spray; sprinkle with 2 tablespoons cheese mixture. 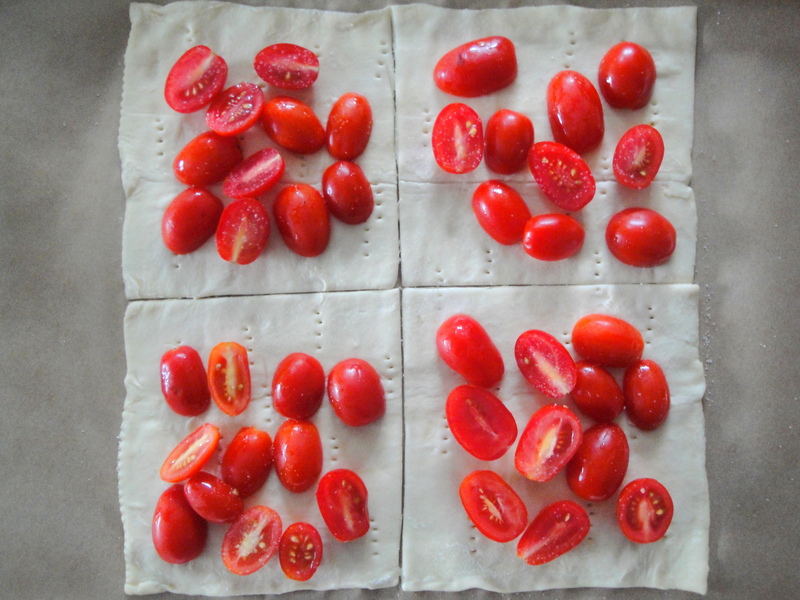 Pat tomato slices with a paper towel. 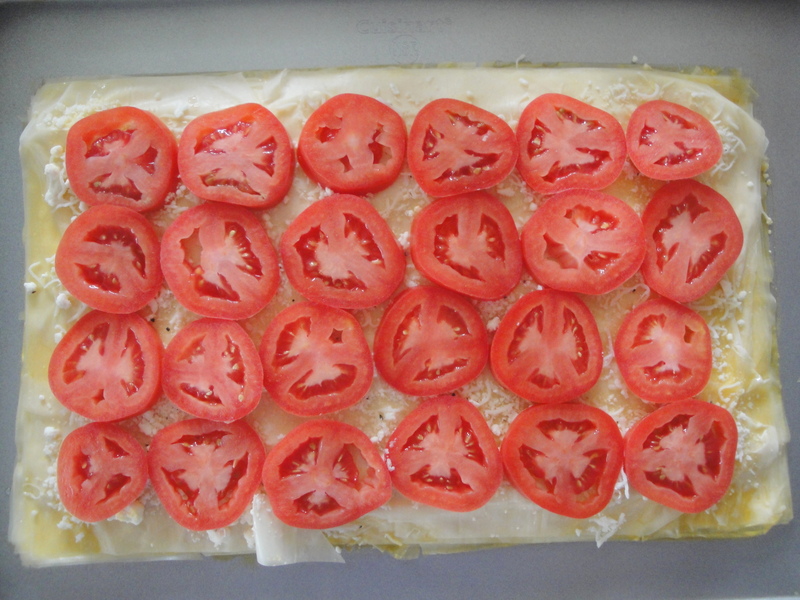 Arrange tomato slices on top of cheese, leaving a 1-inch border. 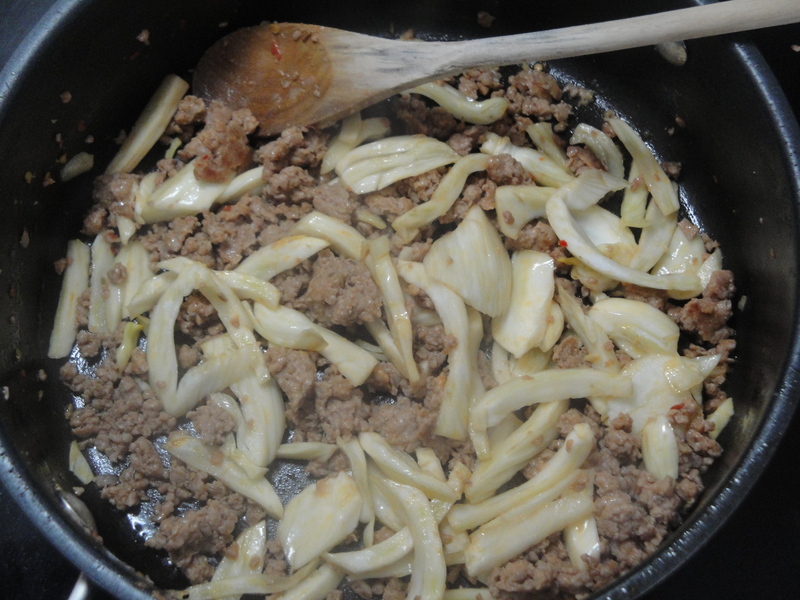 Sprinkle with onions and the remaining 6 tablespoons cheese mixture. Bake at 375°F for 20 minutes or until golden. A new brewery/restaurant opened near my house over the summer and it is now my favorite place to go because of a) the proximity to my house (I can walk there!) b) the beer is good and c) the food is fantastic. So far, one of my favorite items I’ve eaten there was a barbecue chicken pizza with smoked Gouda, green pepper, red onion, and bacon (which I 86’d). 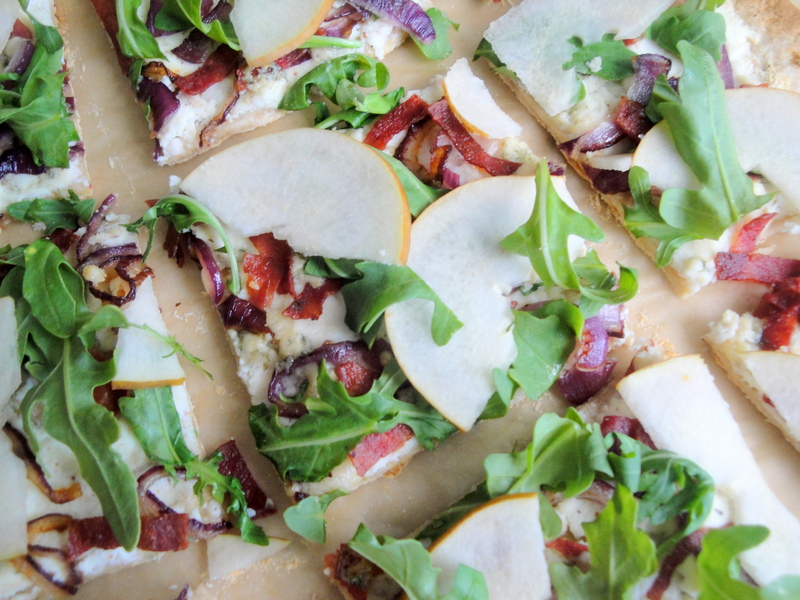 Being a lover of smoked Gouda, I decided I could easily try to make something similar in my own kitchen. 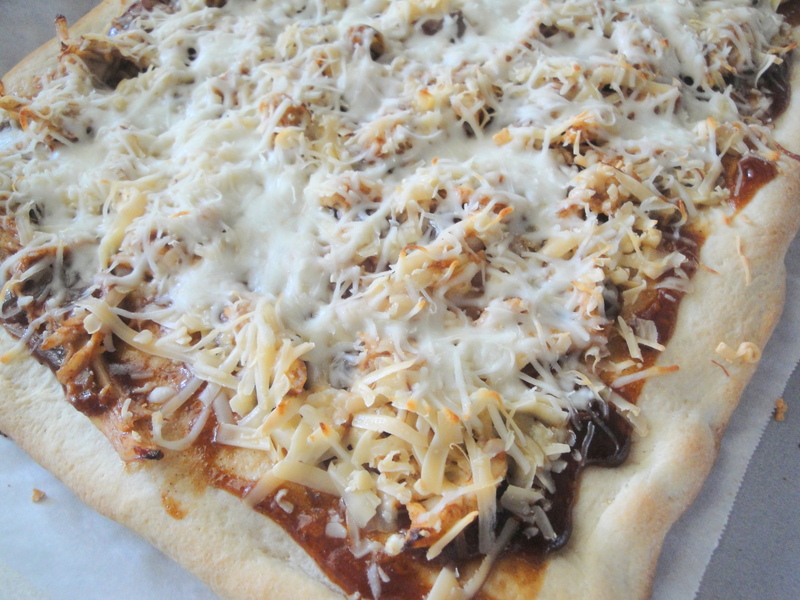 The result was this Barbecue Chicken and Smoked Gouda Pizza. 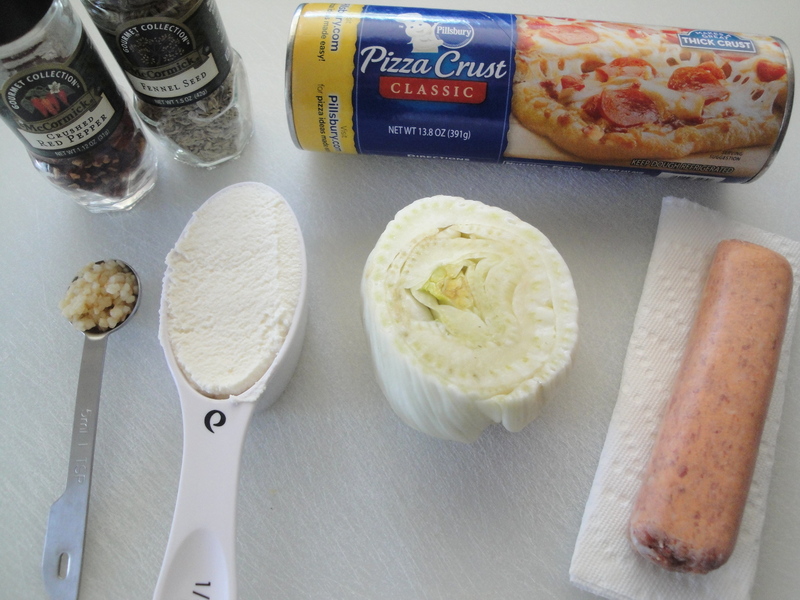 At the time I made this, I couldn’t remember what the restaurant included in their pizza so I didn’t include any veggies of any kind but you could easily add on anything you like here. 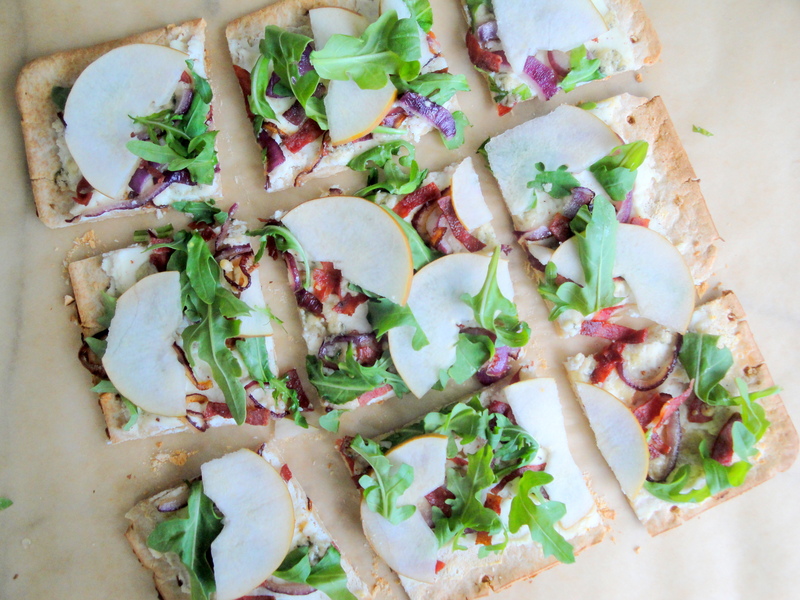 Since you could put smoked Gouda on a piece of cardboard and I would probably eat it, it’s no surprise I love this pizza. And barbecue chicken? I mean, come on, really? What’s not to like? 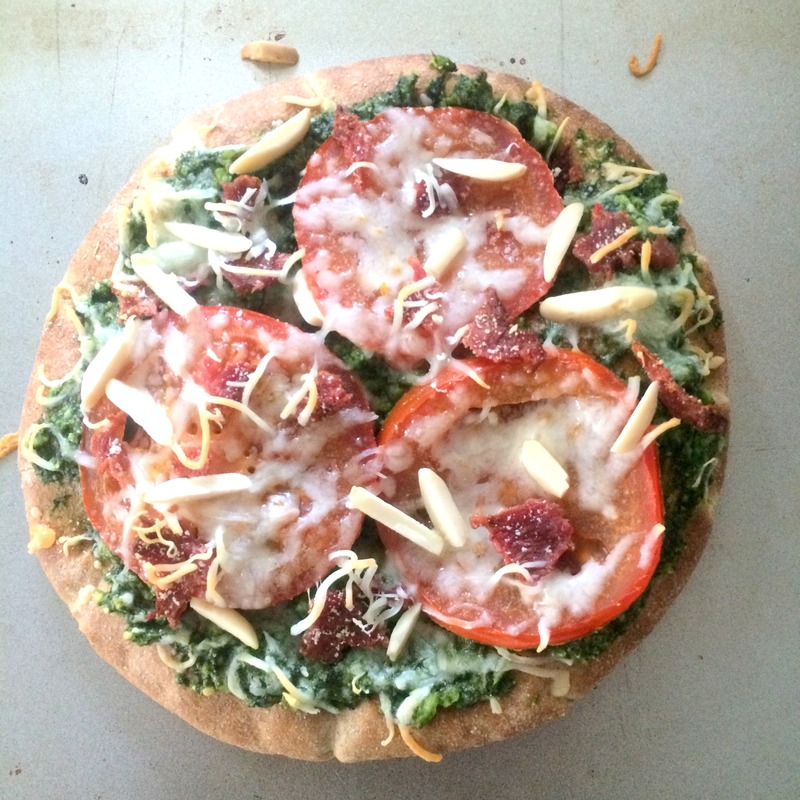 Since I used store-bought pizza dough and pre-cooked rotisserie chicken, this pizza came together in a flash. With so many different kinds of barbecue sauces out there, you can get as creative as you want. 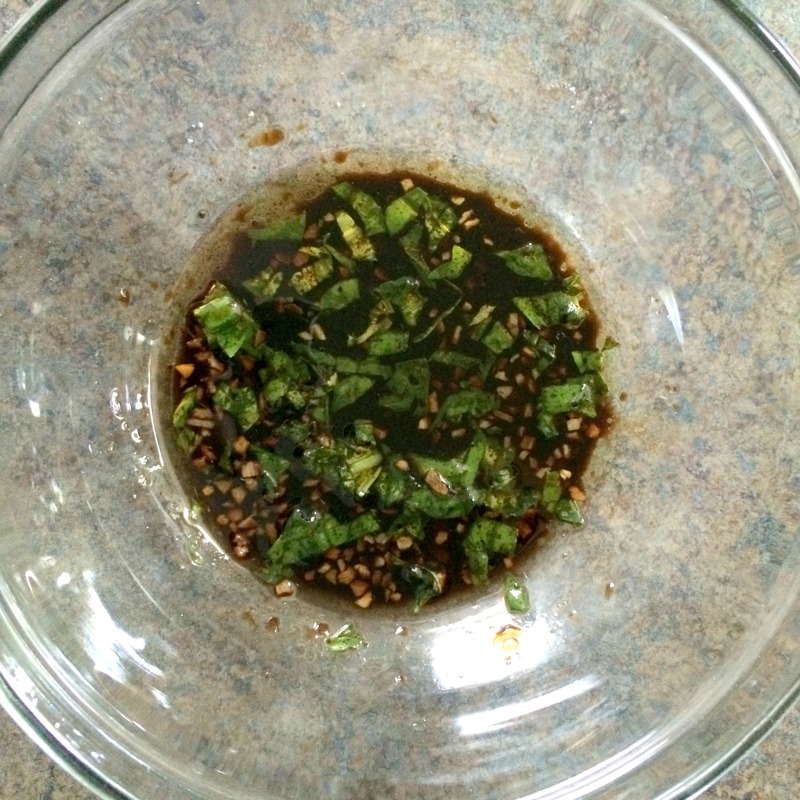 I used plain old basic barbecue sauce but a spicy or mesquite barbecue sauce would be excellent here too. Preheat oven to 400°F. 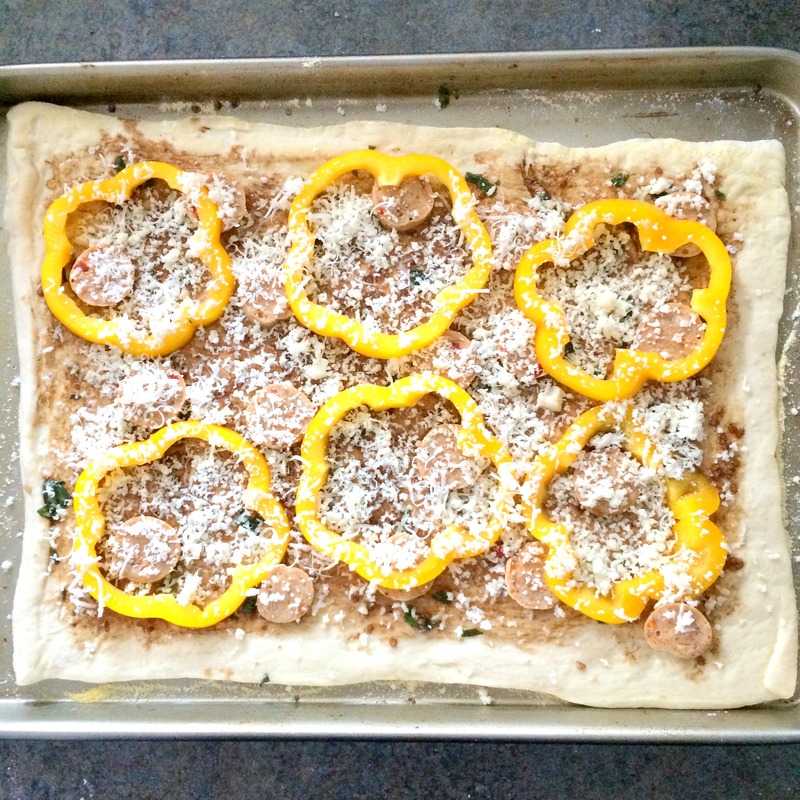 Unroll pizza dough onto a parchment-lined baking sheet and bake according to package directions, approximately 8 minutes. Meanwhile, in a medium-sized bowl, combine shredded chicken with 2 tablespoons barbecue sauce until chicken is lightly coated. 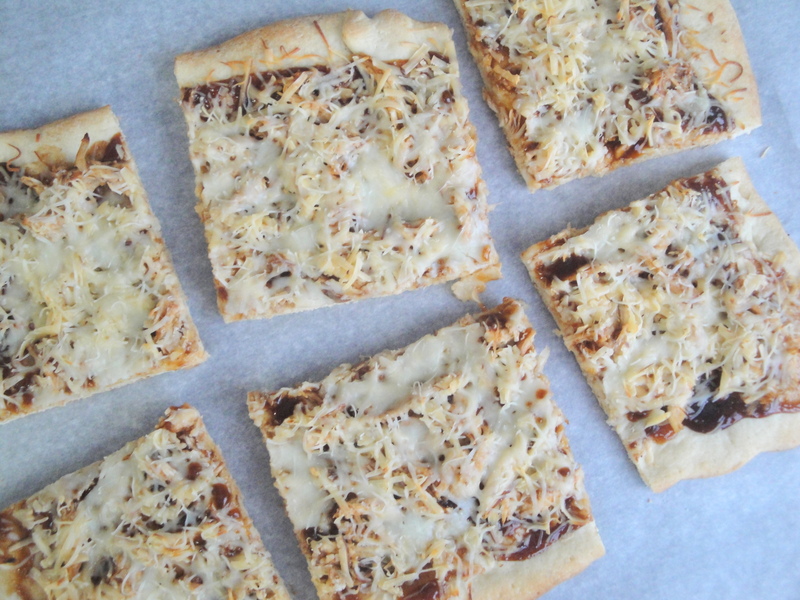 Spoon remaining barbecue sauce onto pizza crust and spread evenly. 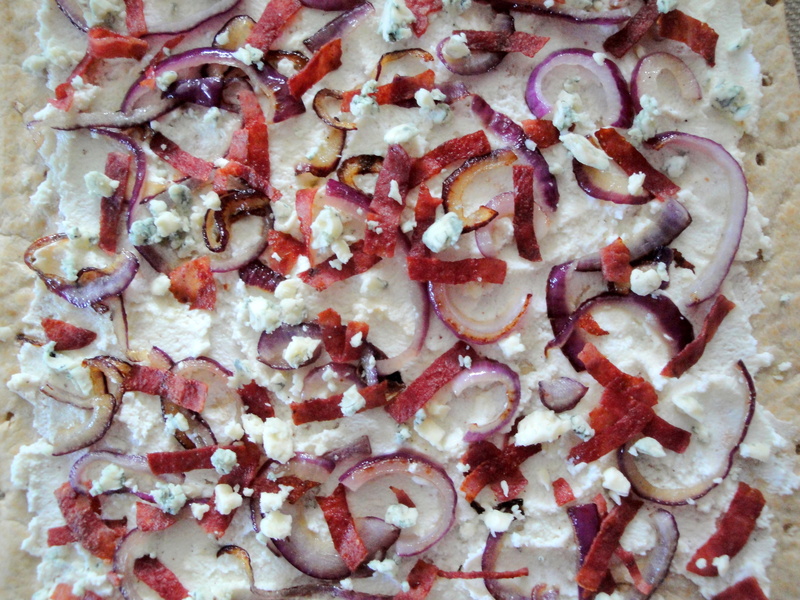 Top with shredded chicken and red onion (if using). 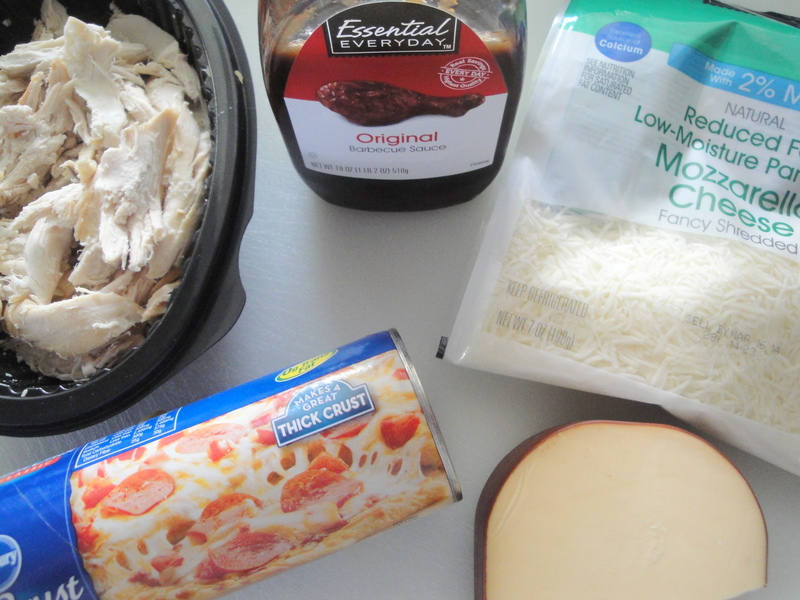 Sprinkle shredded smoked Gouda over chicken, followed by shredded mozzarella cheese. 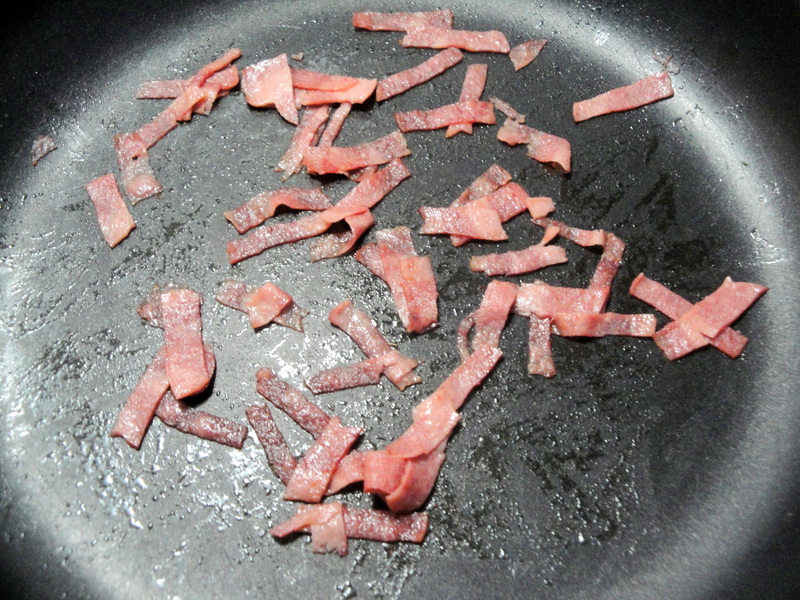 Bake at 400°F for 8-10 minutes until crust is golden brown and cheese is melted. Top with chopped cilantro, basil or parsley (if preferred). 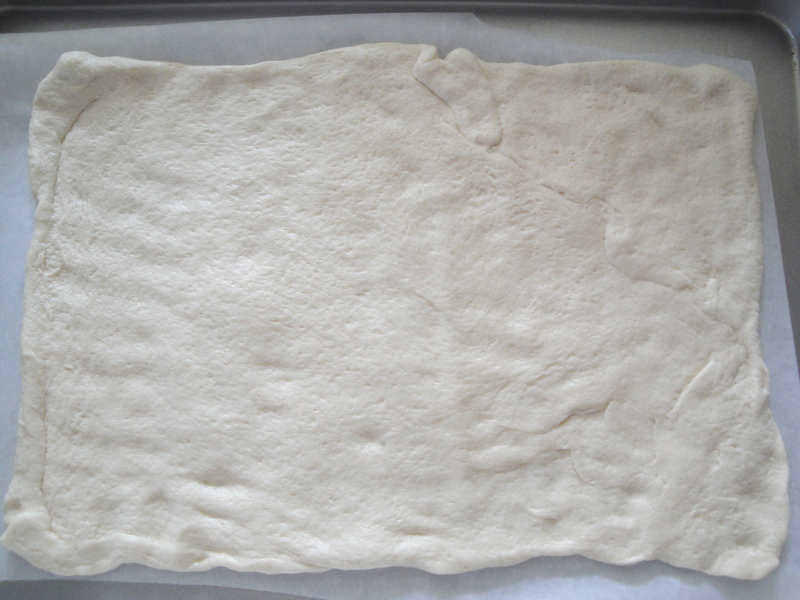 Unroll pizza dough onto a parchment-lined baking sheet and bake according to package directions, approximately 8 minutes. Meanwhile, in a medium-sized bowl, combine shredded chicken with 2 tablespoons barbecue sauce until chicken is lightly coated. 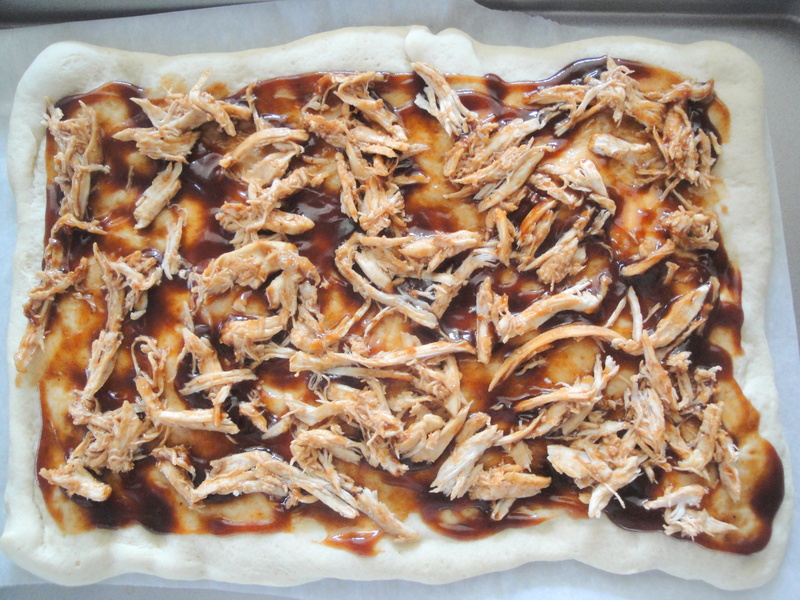 Spoon remaining barbecue sauce onto pizza crust and spread evenly. 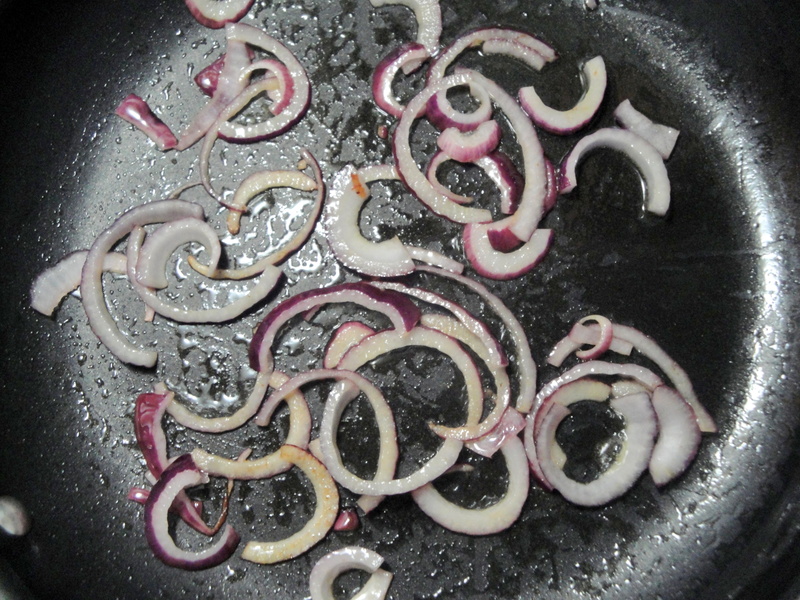 Top with shredded chicken and red onion (if using). 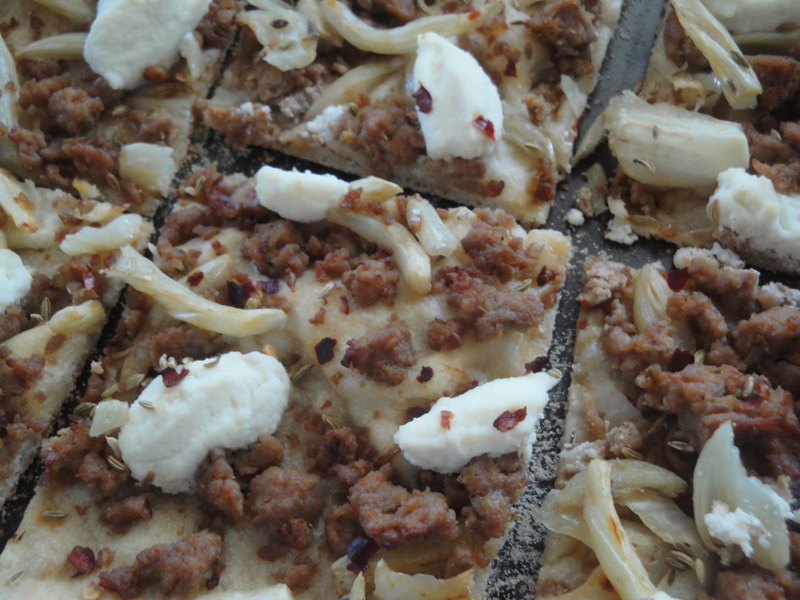 Sprinkle shredded smoked Gouda over chicken, followed by shredded mozzarella cheese. Bake at 400°F for 8-10 minutes until crust is golden brown and cheese is melted. 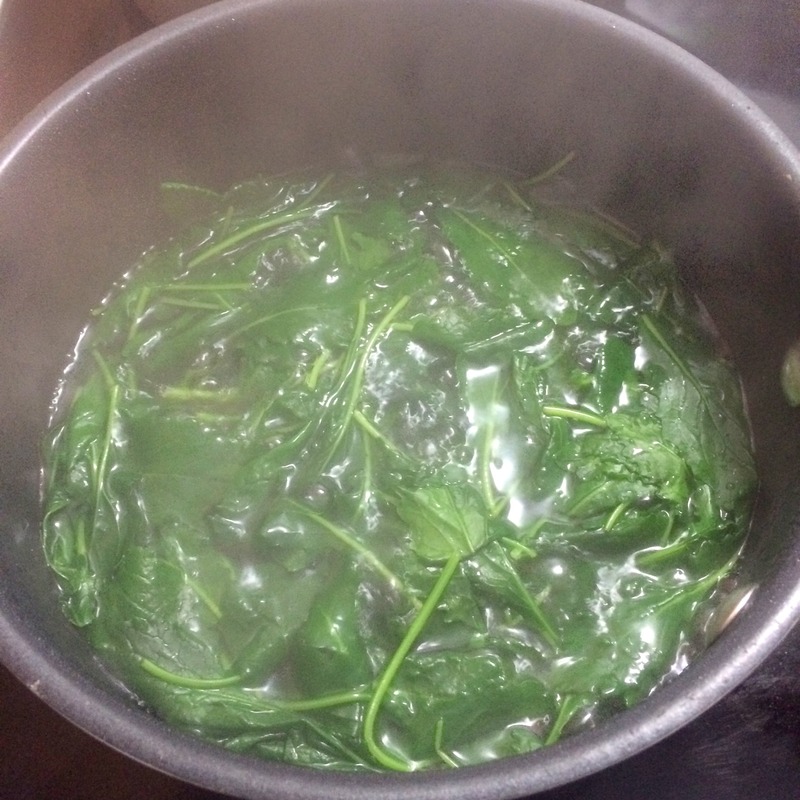 Top with chopped cilantro, basil or parsley (if preferred).